On planet Boborp, all the childrinx go to skrool, just like here on planet Earth. Omek and Yelfred are always late, but it's okay because they are always late together, and everyone knows that best frints do everything together. That is, until Yelfred meets Q-B. Omek is good at sharing many things, but he's not so good at sharing his best frint. 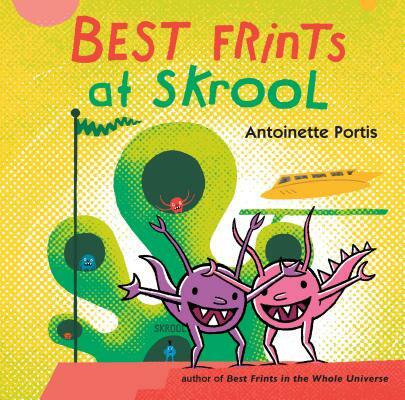 But with a little understanding and a friendly game of Eyeball in the peedle pit, Omek might find that there's room for just one more best frint after all, in Antoinette Portis's Best Frints at Skrool.